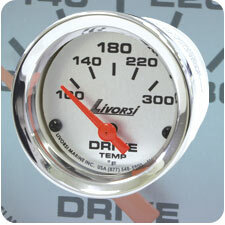 Livorsi’s new drive temperature kit accurately measures the oil (gear lube) temperature of your drive. The majority of all drive failures begin with the drive generating excessive heat. This overheating can only be detected by measuring the gear oil temperature directly from the drive. Drives are expensive, why not take proactive measures to protect them? Drive temperature is displayed on an easy to read 2 1/16” gauge. The use of water resistant, dust proof Deutsch connecters simplifies wiring and installs easily to most outdrives. Help maintain the performance and longevity of your drives, and protect them with the help of the new Livorsi drive temperature kit. 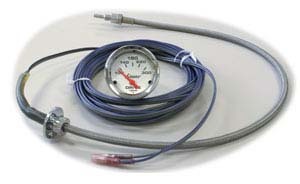 gauge, 25 ft harness, thru hull fitting and temperature probe.